Truth or Consequences, Sierra County, N.M. 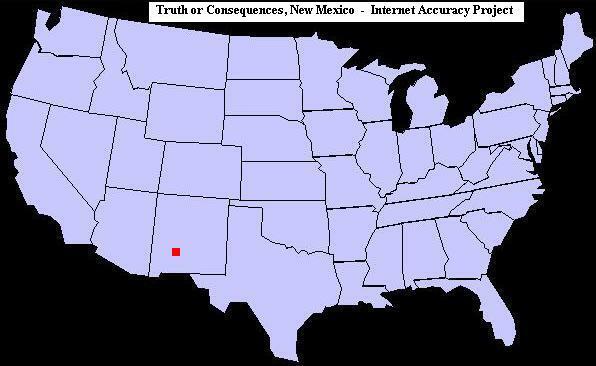 Truth or Consequences is located in Sierra County, in southwestern New Mexico. T or C -- as it's known within the state -- is situated along the banks of the Rio Grande River and is renowned for its many natural mineral hot springs. Truth or Consequences was originally incorporated as Hot Springs, New Mexico, and later became the county seat. It was known for it's beautiful desert and mountain terrain and was a popular health resort and tourist destination for New Mexicans. In 1950, the town elected to change its name to Truth or Consequences, garnering an incredible amount of free publicity for the small town. Truth or Consequences was a hit game show hosted by Ralph Edwards, that began on the radio in 1940. A television version of the quiz show began airing in 1950, and they offered to broadcast the initial show from a town that renamed itself after the show. In addition to hosting Truth or Consequences on the radio, as well as the first year of the TV version, Ralph Edwards was a broadcast pioneer who created and produced a number of popular radio and television shows, including the long-running This Is Your Life. Ralph Edwards not only broadcast the first episode from the newly-dubbed Truth or Consequences, New Mexico, but he faithfully returned each year for decades to help the town celebrate at its annual Truth or Consequences Fiesta. Over the years, Jack Bailey, Bob Hilton, Larry Anderson and Bob Barker each took a turn at hosting the popular Truth or Consequences game show. Just as they had hoped, their decision to rename the town after the show yielded many years of free nationwide publicity, increased tourism and helped bring new residents to the area. Time Zone: Truth or Consequences, New Mexico is in the Mountain Time Zone. Camping, fishing, hunting, hiking, picnicking, boating, sailing, swimming, water-skiing, windsurfing, canoeing, parasailing, rock hounding, mountain biking, birding, photography, golfing, and horseback riding. Antelope, deer, bear, javelina (peccary), bobcat, bighorn sheep, elk, turkey, mountain lion, porcupine, rabbit, fox, coyote, snapping turtles, white-nosed coati, rattlesnake, pelican, roadrunner, egret, quail, crane, loon, geese, duck, goshawk and the eagle. Anglers will find a variety of fish including walleye, catfish, sunfish, northern pike, bluegill, crappie, rainbow trout and largemouth bass.